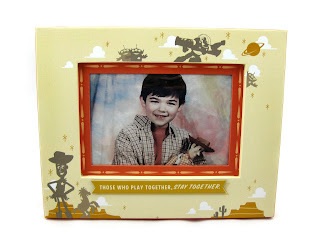 As part of last fall's initial line of Hallmark exclusive Pixar decorative products, here we have one I was looking forward to getting for quite some time- this Toy Story themed picture frame! This is a very cool (and classy) textured paper-wrapped frame with fantastic minimal silhouette designs featuring Woody, Bullseye, Pizza Planet aliens and Buzz against a western/space backdrop. This was released almost a year ago in stores, but has stayed around to celebrate this year's 20th anniversary of Toy Story. Can you believe it's been that long? The size of the frame is 10" W x 8" H x 0.5" D, holds a 4x6 photo and states "Those who play together, stay together." It retails for $14.95 (which is a fantastic price, considering the great quality of this product). Also, it can be displayed standing up, but there's also a hook if your looking to hang it up on a wall. A big thanks to my parents for snagging this for me for my birthday this year. And notice the placeholder picture my mom printed for the frame? Yup, that's me at five years old with my very first Woody toy! I really love this frame; it's totally my style! I love the colors (especially the use of orange, my favorite color) and the overall design. I look forward to printing a legit picture for it for display as well! 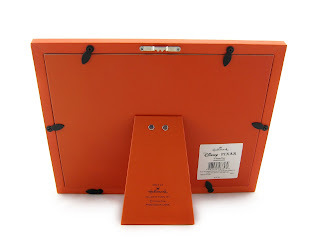 If you're looking to add this to your collection, be sure to check out your local Hallmark store or their website HERE. Please let me know if you have any question or comments!